My family has embarked on a healthy eating journey. However, we still love sweets and dessert items. Growing up, my fondest memories of yummy dessert center around my mom’s infamous apple peach cobbler. Even though it was super sweet I ate it every time my mom baked it. 2017-2018 is my family’s year of transitioning to becoming vegetarians. As we are making our transition we consider what our favorite non-vegan dishes are and explore how to create our favorites with vegetarian ingredients. Recently my husband and I visited a health food grocery store and decided to try a familiar dessert with a healthy twist. I’m so glad we tried this. It turned out great and was very delicious. The best way that I can describe the taste would be to say the dessert was rich in flavor but light and not overly sweet. I promise you won’t feel guilty indulging. For my readers who are visual learners like myself, I captured this recipe through pictures. Please see my recipient below. First, rinse off your apples to clean them of any impurities. Image: apples after I rinsed them off. Next, skin the apples. This can be done using an apple peeling device or using a knife. I chose to use an apple peeling device. At this time remove any leaves or stems from the apples. Once the apples are peeled, slice the apples. This can be done using an apple core slicer. 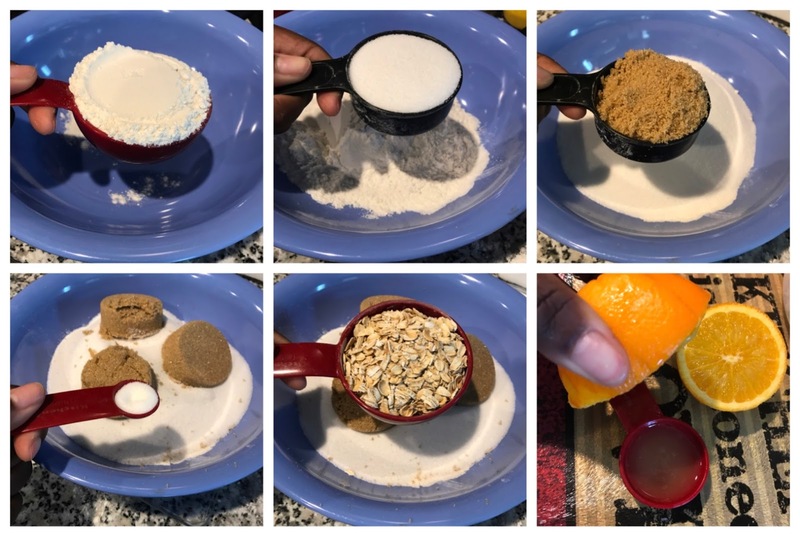 Create your toppings by adding your flour, sugar, brown sugar, salt, old-fashioned oats, lemon juice, orange juice, lemon zest and orange zest into a bowl. Mix the ingredients together. Place your apples in the pan they will be baked in. Scatter your toppings on top of the apples. Add your diced butter over the top of your toppings. Bake your dessert in the oven at 350 degrees F for 1 hour until the top is brown and the apples are bubbly. Serve warm. When I prepared this for my family we had a desire to have ice cream with this dessert. To keep the healthy choices going, we purchased organic vanilla ice cream! We combined a serving of apple crisp dessert with 1 scoop of organic vanilla ice cream and it was very delicious. If you decide to give this recipe a try please tell me about your experience and how your Apple crisp dessert turned out! If you have a variation to this dessert and would like to share what you do when you prepare your apple crisp please comment below! Cooking/ apples/ apple crisp/ dessert/ Blog/ Teacher/ Mom/ Shesteachermom/ Houston/ healthy food/ healthy dessert/ vegan/vegetarian/ Moms/ oatmeal/ DIY/ Picture cook book. permalink.